Toddlers love to move things around and transfer them from place to place. One of my daughters favorite transfer activities involves two large tupperware containers and a bunch of plastic lids. 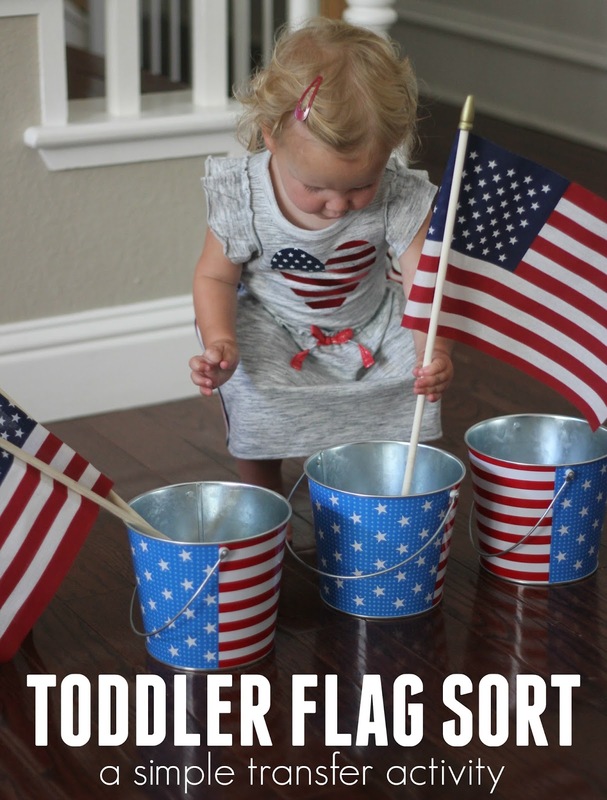 For our A Very Toddler Fourth series today we got out several of our toy American flags and some buckets, and my daughter spent time transferring the flags from bucket to bucket. This activity seems so simple, but it was also a lot of fun! Transfer activities are simple movement activities that help kids build their hand-eye coordination and gross motor skills. If you use smaller items, you can work on fine motor skills as well. To transfer the flags, my daughter had to take a flag out of one bucket, and put it in another bucket. 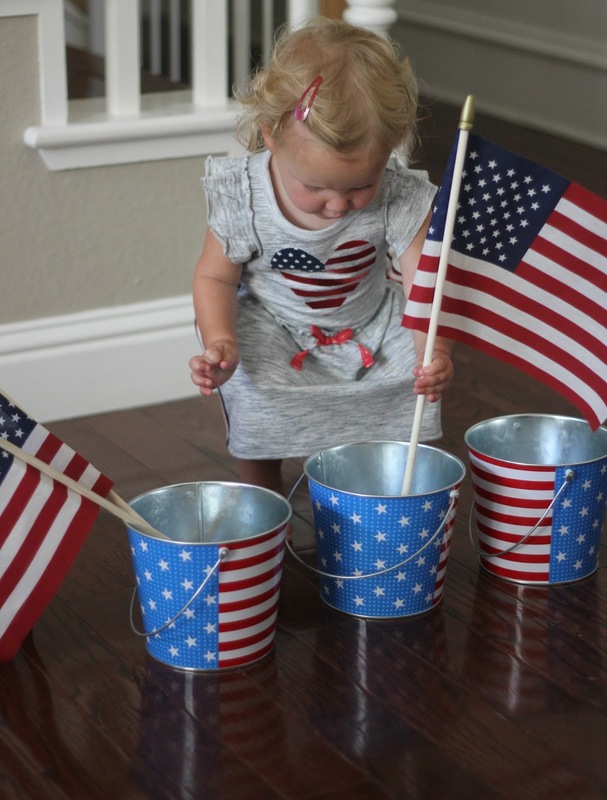 This activity is really simple, but the clinking sound when the flag hits the bucket and the excitement that comes when you wave the flag and feel the breeze on your face, kept her doing this activity again and again. My preschooler wanted to join in as well! We also grabbed a few other simple 4th of July themed items to transfer from bucket to bucket once she wasn't interested in the flags anymore. The sound of the items landing in the buckets made the activity extra popular! My daughter loved dumping out the 4th of July trinkets (necklaces, etc.) again and again and then putting them back in the buckets. Check out all of our other A Very Toddler Fourth activities HERE. Also, make sure to pop over to I Can Teach My Child to see Jenae's Fizzy Flag from yesterday and today's activity as well!